Includes a spigot, airlock and stopper. 12L: Perfect for storing small lots and experimental batches or taking some of your beer or wine along with you to your next party. Approximate Dimensions: 10in Diameter x 14in Height (w/out airlock in place). Note - The maximum temperature that these plastic fermenters can handle is 140F. Perfect size and very sturdy!!! It's difficult to find this size. need some smaller fermenting tanks. For storing wine , should fit in fridge ok . easy to carry and serve. I'm interested in the blow off tube assembly shown in the picture of the comment from Dennis K. (July 5th). What are those white plastic elbow connectors attached to the grommet on the Speidel that he's using for his blow off tube assembly? BEST ANSWER: Hello Maurice - They look to be push-in fittings for RO water filtration systems. Similar to a larger SharkBite fitting. Search John Guest fittings. I used something other than Dennis K, what was offered previously...had to cut hole in the top to accommodate it but works well. His looks like a nice setup. Appears to be a 1/2" rubber grommet, and then a 1/2" plastic elbow with tubing. I would also make darn sure you have something else that could be used as a "plug" that is identical diameter. If you have tubing that fit this, you could potentially stick the tubing through the grommet hole as an option. 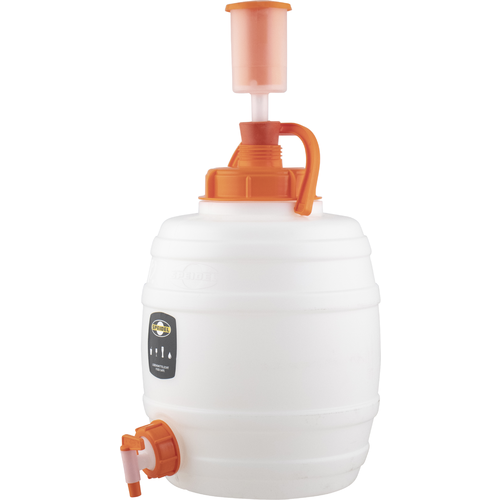 Has anyone tried a speidel plastic fermentor to make Kombucha? BEST ANSWER: I own 5 of these fermenters from Speidel and have used them for beer and wine multiple times. I’m sorry I haven’t used them to make Kombucha, however; these vessels are made of food grade (HDPE) so I would recommend them for any liquid you wish to ferment and consume. I not certain but I’m pretty sure you can use these with liquid up to 200 degrees Fahrenheit without any issues or concerns with off flavors or melting plastic. Hope this helps. I highly recommend these fermenters. I use it for kombucha, it works well as a fermenter for continuous brewing . 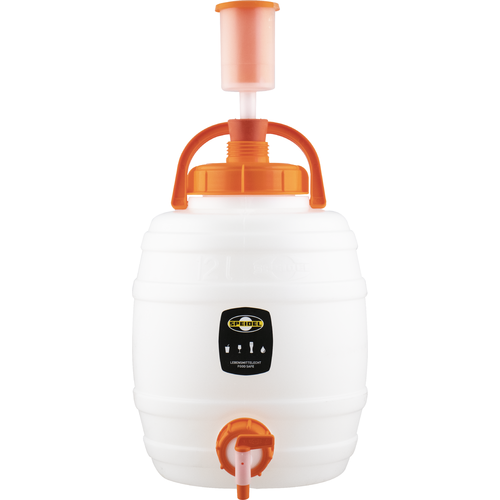 Great little fermenter, easy to clean, easy to handle, easy-to-use. I would recommend them for anyone who wants that make smaller batches here and there. Love this size. Just wish the lid came equipped with a siphon port. Customizing them myself didn't go smoothly. But I prefer the smaller size for smaller batches. 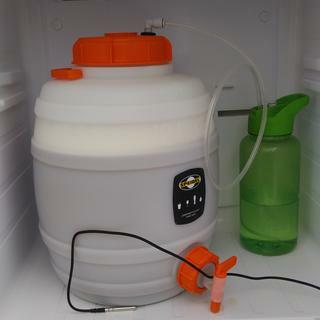 I previously purchased a 30L Speidel Fermenter and love it! Recently, I realized I had the perfect spot in the my beer refrigerator/freezer for a half batch fermenter and ordered a 12L Speidel. 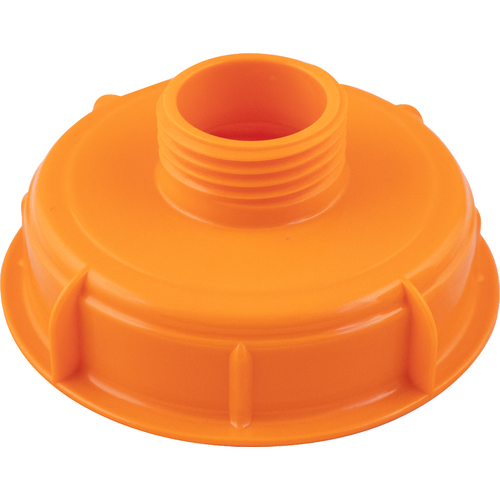 As its name indicates, the 12L is designed for storage and travel, but with a 1/2" hole drilled in its top, an air lock grommet may be easily installed. Because of little headroom above 2.5+ gallons in the Speidel and because I didn't have room for a typical air lock, I decided to use a blow off setup instead. Works great! I recommend the Speidel plastic fermenters ... very well made, lots of accessories available, easy on the wallet and fun to use! When I received two of these for Christmas I was so excited to use them! Then, while sanitizing, I noticed that the spigots leaked no matter how tight or loose I screwed them on. I followed the directions and, despite multiple attempts, could not get them to seal properly. I'm sure Speidel makes great stuff. However, these carboys are being sent back. If it does not work, it does not belong in my home brewery. Sorry Speidel, looks like I'm staying with PET carboys for now. As others have pointed out, it is very easy to drill a hole in the lid for a grommet. The one drawback is that the handle is rendered useless if you use an airlock. These are nice little fermentors for stove-top or counter-top BIAB batches. My one major con for this product is the HDPE tends to hold onto smells (wort smells and fusel alcohols) and it discolors with time, if you brew darker beers. One thing I noticed is the carryover of those wort odors into other lighter beers. Buckets will do the same thing over time; I guess I was hoping for so much more when considering the price of these vs a bucket. I have since switched to a similar size, glass, wide mouth fermentor due to the staining and retention of odors. 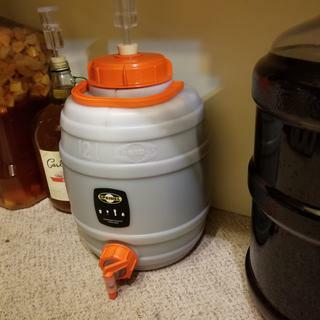 I know this isn't technically a fermenter but I just drill a hole in the top and insert an Airlock Grommet FE349 and it's now a small fermenter for my 2 gallon batches. It comes with a spout and a cap. I drilled the cap and put in a Brew Bucket Valve w/ Racking Arm FE800V. You can then rotate the spigot, arm and all, when draining and easily keep off the trub. The Speidel itself is excellent. It's very well built and the handle is solid. These things rock. I got one to replace a certain popular beginners kit's fermenter....that split down the seams. I have 3 total now, and just ordered a 30L as I'm gearing up for larger batches. I've examined other fermenters, and even considered a conical, but came back to speidel. They are durable, affordable, easy to clean, if you drill out the 12L top and cut the center out flush with the inner lid ring it'll take a 9.5 stopper and will accept a normal airstop. Its perfect for 2 and 2.5 gallon batches if your using popular sized beginners kits. I will continue to use these for many many years even after going to larger batches for wine making and experimental beer batches. Love this thing, and started using it almost immediately after receiving. Other than the desire for some way to add an airlock, which as others have pointed out, is super easy to add yourself, the only "defect" or less-than-ideal part of construction is that the threading for the lid isn't clean. Basically, there's a bunch of untrimmed plastic from when this was put into the mold, and it can cause major difficulty loosening and tightening the lid. Spent 5 minutes using a sharp utility knife to trim off this extra plastic from in-between the threads, and now it works like a charm. -1 star for the amount of extra effort needed to make this really worth while. I bought two of these for small batches. I did drill a 1/2 hole in the lids and put a grommet in and use 3 piece air locks in them. It worked quite well. I really liked transferring with the spigot. I do have some minor concerns about being able to clean the spigot's fully but not too worried. Overall this is currently my choice for my 2 gallon sized batches. I do those to fill a 5L mini keg and usually get enough for most of a 2 liter with a carbonation cap to try out the batch long before it is naturally carbonated in the mini keg. Just got my 12L Speidel. Like the description points out, this doesn't have a hole for an airlock. No bother, a spade bit later and i'm reusing my #6 drilled stopper and 3-piece airlock. Word of warning: Don't carry by the handle when the airlock is in place. 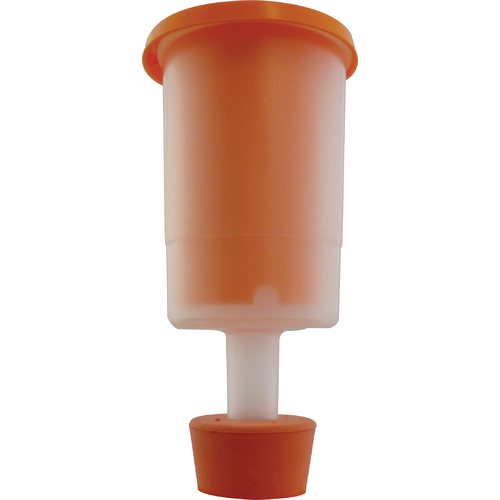 Replace airlock with a solid stopper if you need to use the handle. All told, having to drill my own airlock hole was a small price to pay for the built-in spigot and a wide mouth for cleaning. Wanted something a little better than the Mr. Beer keg I got for Christmas. This was the ticket! Perfect little fermenter for small batches. Works great - no leaks! After using buckets for years and always having the same problems as others with the spigot valves causing the buckets to cave in slightly causing drips. I am sold on the solid construction and quality of Speidel. Cheers. I recently purchased this along with the 5 gal and 7.9 gal Speidel fermenters. These things are easy to transport and extremely easy to clean. I now use these exclusively (except for sours). No more worrying about breaking glass! Great large fermentor for the price. Easy to clean, and spigot works great. Only downside is that I'm constantly worried the handle will break while carrying a full fermenter, but if you're careful it should be fine.